Click here to go to Jubilee Weekend 2012. Take action against illegitimate debt and together, let's stop the global debt cycle! Join Jubilee USA Network the weekend of October 14 for our Jubilee Weekend. In conjunction with Illegitimate Debt Week with our partners in the Global South, we can make a difference. Communities across the country and around the world will be taking action! Will you join us? As our global partners take action, Jubilee USA is calling for actions throughout the United States to support our upcoming policy initiatives. This fall, Jubilee USA will introduce the Jubilee Act into Congress. The legislation will provide solutions to the international debt crises and work towards implementing responsible lending and borrowing practices for International Financial Institutions. Through its passage, mechanisms to promote transparency and accountability and will produce greater worldwide economic justice. Take pictures of your community taking a stand in solidarity to urge your member of Congress to stop the global debt cycle. These same pictures will be sent along to our partners in the Global South with a message of support! 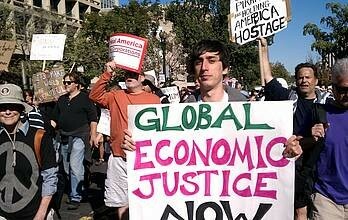 As part of Jubilee Weekend, Jubilee USA also joined fellow activists in the Occupy DC protests on October 15! Jubilee USA is supporting the Occupy movement for global economic justice by marching with our fellow social justice activists in DC Jubilee is part of the global movement demanding reforms of International Financial Institutions, unjust banking practices, irresponsible lending and borrowing practices and tax justice. All of these issues continually foster national and international poverty and inequality. To learn more about Jubilee USA's Occupy DC involvement, email Jeremy at jeremy(at)jubileeusa.org.